The police commissioner has announced to media that he has directed for a temporary closure of the fraud office. Commissioner Gari Baki says that he has taken the stance to regain command and control of the police force. He says the decision today by the courts to reinstate Matthew Damaru sets a bad precedence that if any officer is aggrieved by a decision that is made by any commanding officer, he or she can run to the court and stay the decision of the suspension even if the officer has committed a criminal offence. Baki says this matter is purely administrative and should have been handled as an internal matter within the organisation. The Waigani National Court in Port Moresby stayed the suspension of Fraud and Anti-corruption Director Mr Matthew Damaru today, upon an urgent court application by his lawyer and Queens Council Mr Greg Egan. The urgent court application which was filed yesterday surrounding the risk of fraud files being tampered with while Mr Damaru was on suspension. Mr Egan when presenting the submission added that Mr Damaru has been spear heading the investigations into the K71.8m Paul Paraka Saga and other corruptive activities in the country; therefore it is a matter of urgency and paramount interest that Mr Damaru resumes his office immediately. 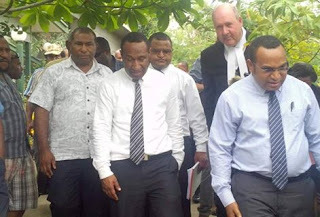 Meanwhile lawyers representing the police commissioner and the state requested for more time to look into the submissions made by Damaru’s lawyers as they claimed, they did not receive the submissions and needed ample time to make their submissions. However, Justice Allen David saw the urgency in allowing Damaru to resume his office for the sake and safe keeping of the fraud files. The court also restrained the police force from threatening any of the fraud squad members and not to interfere with investigations. 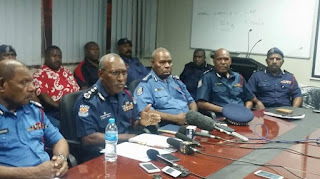 PNG's Anti-Corruption Fraud Squad Director Mr Mathew Damaru and his Deputy Thimothy Gitua plus 4 other officers spear-heading the investigation into huge sums of money missing through bogus and corrupt deals have been suspended the Police Commissioner. This morning the Supreme Court three man bench (3 judges) handed down a unanimous (all in agreement) ruling dismissing Appeal proceedings SC87 of 2014 filed by Minister of Finance James Marape. 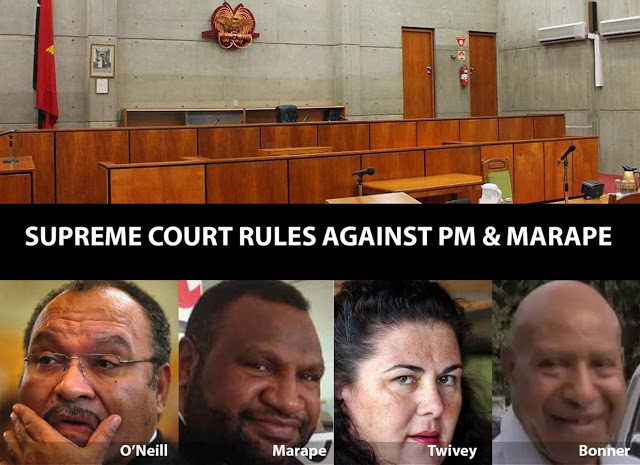 Marape filed the SC87 Appeal challenging an earlier ruling of the National Court that refused the Prime Minister Peter O'Neill and Marape's application (request) preventing Police from arresting them in relation to the illegal payments of K71.8 million to Paraka Lawyers. So what does it all actually mean? In short, the Supreme Court in the course of the above proceedings issued an interim stay (temporary stop order) preventing Police from arresting Marape and O'Neill including his lawyers and staff until it made a final ruling. Now that the Supreme Court has ruled against them dismissing the case it means the interim stay order issued in those proceedings have also been discharged (no longer in force). So can the Prime Minister or Marape file further proceedings? No. Once an appeal has been determined by a three man bench or more of Supreme Court it is final. They may file a slip rule application but it would serve no effect. However further appeal proceedings are no longer available to them. Anti-corruption police in Papua New Guinea arrest one of the country's top judges and charge him with judicial corruption. Anti-corruption police in Papua New Guinea have arrested one of the country's top judges and charged him with judicial corruption. 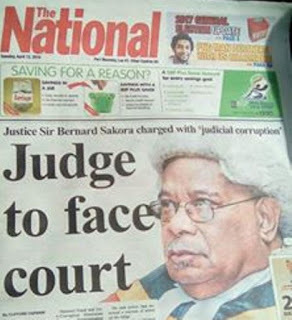 Police said Supreme Court judge Bernard Sakora accepted a 100,000 kina ($45,000) payment in 2009 from a company linked to Paul Paraka Lawyers, a law firm accused of defrauding the PNG Government of millions of dollars via inflated legal bills. The director of PNG's National Fraud and Anti-Corruption Directorate, Matthew Damaru, said his officers came across the payment while investigating the complex and long-running case. "The arrest is a result of ongoing investigations to the payment of legal bills to Paul Paraka Lawyers where this payment to the judge was discovered and the investigation conducted into the payment made," he said. "He [Bernard Sakora] denied receiving the money."